RAW after the PPV: Brock Lesnar is absent from RAW (there’s no point having him on all the time, especially if we use him on the PPV after and the PPV before all the time, it’s too repetitive and could get monotonous). John Cena should also be taken off air, probably for twice as long as before so two months – making a return either in the weeks building up to the Royal Rumble or at the Rumble itself as a surprise entrant (but god forbid, please don’t make it #30, introduce the excitement earlier rather than playing to the #30 return spot EVERY single year). Opening: recap highlights video from the night before. Video segment in the middle of the show: another vignette showing Brock’s destruction through Big Show, Undertaker, John Cena and Chris Jericho in the past year. He appears invincible, who will stop him? Closing segment: Paul Heyman comes out to address the WWE roster, asks everyone to come out, cursing through them all, saying that no one will be able to go the lengths needed to defeat Brock Lesnar. As he continues, he gets cut off by music playing – not anyone’s theme song though, it builds, and as we keep hearing it, we realise that it’s the theme song to ECW. The show’s graphic is playing on the titantrons, the lights in the arena go down and when they come back up – we see RVD back in the ring with a steel chair, taking out the Paul Heyman guys. He then grabs Heyman, attacks him with a chair. Van Dam then takes out the PH guys again as they try to attack, but he takes them out. He then pauses, looks around and sees that Heyman has crawled into the corner. RVD runs over and hits a running drop kick into the corner on Heyman. Not satisfied, he then places the chair on Heyman, goes to the adjacent corner and then hits the Paulrus with the Van Terminator, going coast-to-coast! RAW closes with ‘One of a Kind’ playing and Rob Van Dam standing tall over Heyman, Axel, Ryback and Cesaro. SIDE NOTE Why RVD? Because of all the players left, given the high-calibre PPVs that make up the first third of the year (Rumble, Chamber, ‘Mania) we need a star that has a legacy, can work, has genuine sympathy and likeability and a history between himself and Paul Heyman. Not to mention, ideally the story takes it from there, particularly given the fact Brock attacked RVD so savagely a few months ago. We can let the action breathe, there’s no appearance by Heyman or RVD on SD! outside of any video packages. RAW: Christian hosts The Peep Show with his guest, Rob Van Dam. We hear RVD talk about the beating he was given as a result of The Heyman guys and Brock and wants it to be made very clear. He’s medically cleared to fight whenever and won’t be waiting until Survivor Series. This is a beating that has been coming to Brock Lesnar, the big spoilt baby, for a long time, especially after what he did to himself and Jericho, one of Christian’s good friends. He is then interrupted, unsurprisingly by Paul Heyman. But via videolink, as Heyman is still suffering horrifically from the injuries caused by The Van Terminator (even his mouth has been sealed, making it hard for him to talk properly). He is accompanied by his men, the Paul Heyman Guys, who attempt to deliver the message on behalf of Paul, but are unable to do so due to Paul’s inability to speak (good source of humour can be found here as Christian and RVD just rip into Heyman). But they do not get the last laugh as later in the night, The Authority place RVD and Christian in a 3-on-2 handicap match against The PH Guys. RVD and Christian come out on top nonetheless in a tough contest. SMACKDOWN! We see RVD and Christian in singles action against Ryback and Cesaro, with both coming out on top again. RAW: Heyman returns and answers to the critics that have accused him of abandoning ECW. He vows vengeance against that company’s legacy, and that he wants to be the one to put in the final coffin for Extreme Championship Wrestling. The Paul Heyman Guys bring out the beaten up carcass of Christian and continue to keep attacking him, knowing RVD hasn’t made it to the arena yet. In the closing part of the show, RVD welcomes the guys from ECW into the ring, and everyone vents on their frustration that was caused because of Heyman, heightened particularly after what has happened to Christian. Van Dam is the last of that dying breed, and the rest are no longer in a position to make the difference that he can. RVD is the only ECW original left that can do something, can beat Brock and win the WWE Championship. He also needs to find redemption for himself after dropping the ball years before, and now was his time to shine. Suddenly, we hear LESNAR’s music hit, and he comes out with the other Paul Heyman Guys, armed to the teeth with chairs and canes and ladders. They get into a huge brawl but the PH Guys and Lesnar get the upperhand. We then see RVD restrained, while the other four pick each one apart, abusing them viciously – all the while Heyman just admiring the carnage around him. RVD is left unscathed, just alone in the ring but surrounded by everyone close to him fallen around him (Fonzy, Sandman, Sabu). Heyman announces that Rob will really have to survive the fight with Brock, particularly given that their fight at Survivor Series will be contested under EXTREME RULES, so he has a fitting burial ground like his comrades slain before him. RAW: We see RVD pacing about backstage in the parking lot, perhaps wielding a chair or a pipe, just waiting for Brock. This continues throughout the night. He ignores anyone trying to interview him or speak to him. He wants Lesnar and he’s baying for blood. Closing segment of RAW: Van Dam is still waiting outside and so Heyman takes the opportunity to enter the ring. 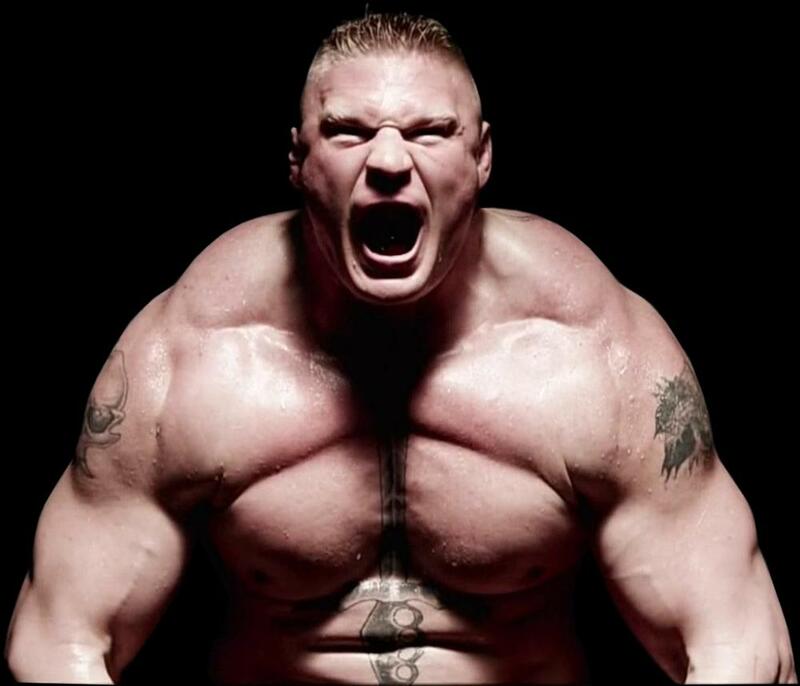 He tells the WWE Universe that Brock Lesnar has already won the fight on Sunday, merely by his actions last week. He did more damage to Rob’s psyche then and didn’t even have to lay a hand on Rob. Imagine what he’s going to do to him when Brock wants to do more than send a message, to really hurt him. When Rob comes out to confront him, Heyman feigns fear, before revealing that if Rob wanted to get his hands on Brock, he didn’t have to come all the way to [insert city RAW is taking place in], he should have just stayed home. Paul tells the world, that even if he had been a shmuck of a businessman as everyone likes to think, he still has all the records of people’s phone numbers, addresses and contact details. Rob momentarily loses his cool and leaves the ring up the ramp, but then stops himself, and head back to the ring, calling Paul out on his bluff who becomes genuinely terrified and starts screaming for Brock to come and save him. Just as he gets his hands on him again, Lesnar’s music hits and an all-out free-for-all erupts between RVD and Brock, with Van Dam showing his martial arts expertise can keep up with The Beast’s brute force. SURVIVOR SERIES: Brock defeats Van Dam in a brutal fight, but nonetheless a very strong showing by RVD. However, Brock is starting to look invincible now, his scary feats of strength, speed, athleticism and stamina, culminating in his destruction of everyone should continue to be fresh and entertaining whilst dominant. Volume V is going to be one of the most difficult now, but let’s see what we can come up with as the roster gets further and further depleted. Article originally published on Pyro & Ballyhoo HERE.